Autostrade per l'Italia Chief Executive Giovanni Castellucci says that his company will make available half a billion euros to help Genoa, and they will be able to build a new steel bridge in "eight months"
The head of the Italian infrastructure giant under fire over the deadly bridge collapse in Genoa said Saturday that 500 million euros will be made available to help the city and to rebuild the viaduct. 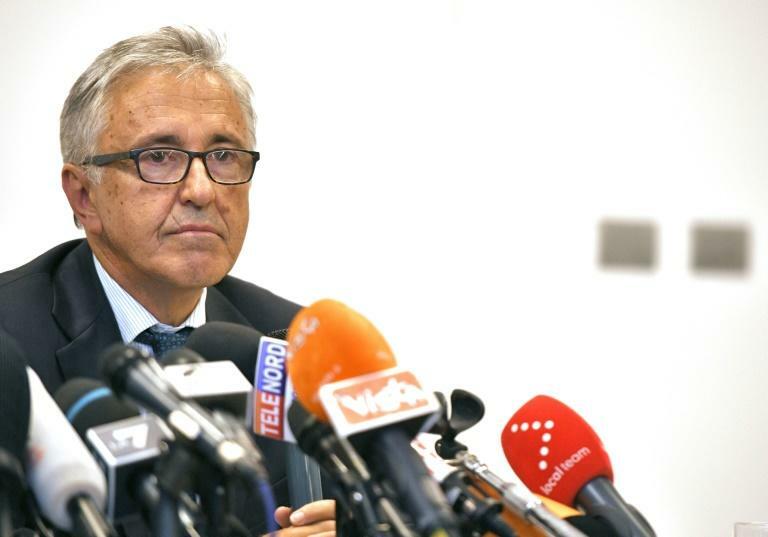 "Doing the sums we arrive quickly at half a billion euros... these are funds that will be available from Monday," Autostrade per l'Italia chief executive Giovanni Castellucci said at a press conference. Castellucci said that Autostrade, which runs almost half of Italy's motorway network, would be able to build a new steel bridge in "eight months". Castellucci also said that a fund worth "millions" would be given to Genoa city council for the families of the victims of the disaster, which has killed at least 40 people. Another fund worth "tens of millions" would be given to the city to help relocate the hundreds of people evacuated from their homes following the bridge's collapse on Tuesday. Autostrade chairman Fabio Cerchiai said that if Autostrade were given the authorisation they would be ready to start building the new bridge "on Monday". "All we need to be given the permission to do it," he said. Cerchiai also said Castellucci would remain CEO despite government calls for the company's management to step down. However, both refused to comment on the company's strained relationship with the new government, made up of the anti-establishment Five Star Movement and the nationalist League. Key ministers Luigi Di Maio, Matteo Salvini and Danilo Toninelli have all blasted Autostrade's management in the aftermath of the disaster, blaming the company for a lack of maintenance that it says caused the collapse. Castellucci didn't offer any reasons as to why the bridge collapsed, saying that all of the company's reports about the viaduct said it was in good shape, and that images from the surveillance camera were blurred by the torrential rain that fell at the time of the collapse. "But this will all be subjected to checks and examination from the judiciary. We all want to know what happened," he said. Castellucci said that Autostrade would conduct checks on every bridge in its 3,020 kilometre-long network. "The bridges on our network are safe, but I have asked everyone to carry out a critical analysis. Excessive caution seems the right idea at this moment in time," he said.